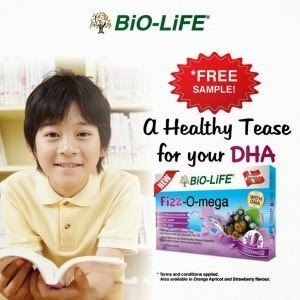 BiO-LiFE Fizz-O-mega is a yummy and convenient DHA drink your whole family will enjoy. It is 1st in Malaysia that applies this new and effective technology from Denmark, combining DHA fatty acid and water in a single sachet dose. Each sachet contains 150mg of DHA in a smooth and creamy orange-apricot flavour with fizz taste. The unique microencapsulation method is used to mask the unpleasant fishy smell and fishy taste caused by oxidation – making it a tasty flavoured fizzy beverage with odourless fish oil for your daily DHA needs! 3. Redeem your free sample! Free sample giveaway ends on 10 December 2014, or while stock last.